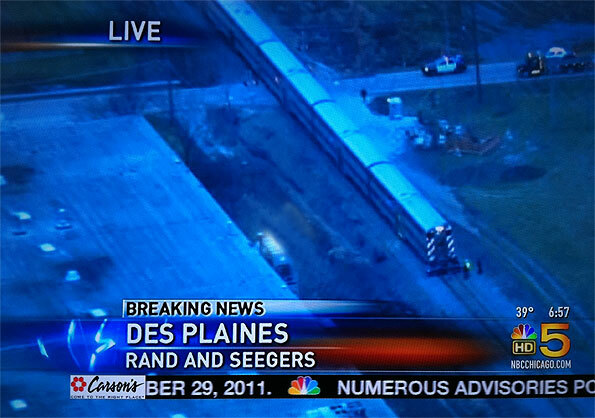 A Metra North Line passenger train is reported crashed with a vehicle at Seegers Road. Originally passengers called 9-1-1 and didn’t know exactly were they were, which had Mount Prospect police searching the Kensington Road intersection, Prospect Heights police searching near the Prospect Heights Metra Station and Buffalo Grove police searching their crossings with the North Line. Train #100, scheduled to arrive Chicago at 6:55 a.m., is stopped north of O’Hare Transfer due to a grade crossing accident. The duration of this delay is unknown. Metra will update this site as information becomes available. By rail, the crash site is located between the Prospect Heights Metra station and the O’Hare Transfer station. By roadway, the crash site is on Seegers Road between Rand Road and Northwest Highway.